How Long For Better Local SEO Rankings? No matter what you hear or read, local SEO is alive and well. It’s the reason you’re here reading this blog post. You obviously want to know how long local SEO and better search rankings will take. You might be wondering how long is it going to take to see page 1 and top 5 search rankings. This is a common question I get asked during almost all of my calls and emails from potential clients. It’s understandable as you want to know when you can start seeing more traffic, leads and clients come your way. The problem with trying to answer this question is that it’s too difficult to correctly predict. There are too many search rankings factors to do this. I use to offer a guarantee for our SEO services but I stopped that very early on. Why? Because I think our past results prove that our services work. That and I wasn’t getting the types of clients I wanted. Regardless, I always give a potential client a rough estimate of when they can expect to see page 1 results. Once our SEO work begins and a few months go by, I can see how the search rankings are improving and give a better idea of when page 1 and top 5 results will occur by. But at first, I need to look at a few factors. There are 200+ search ranking factors, but these are the ones I look at when determining how long it will take to rank a website. With every potential client, I always suggest a three month trial period of our services to show them what kind of results they can expect to see after 6 and 9 months. If after three months we don’t see much improvement, it’s not a good sign. If that’s the case, which it rarely is, I offer a partial refund for the three months. It’s risk reversal. We have to perform and generate better search rankings in those first three months. If we haven’t, then I don’t feel comfortable receiving money for not doing our job. With this three month trial period, you might be wondering if that is enough time to improve the search rankings to page 1 and the top 5. Rarely will this happen, unless you are already ranking somewhere on page 2 and have an existing website. Existing websites are, for the most part, going to take less time to rank. Why? Because an existing website has been indexed by the search engines, has business listings and backlinks created along with quality SEO content on the site. It’s built up existing credibility with the search engines which is going to take a lot less time to rank than a new website. A new website doesn’t have the credibility and thus, is going to take a longer time to get to the top of the list. In all cases, SEO is a long term investment. Once you rank higher, you stay there as long as you update your website. With traditional advertising or even pay per click (ppc), you always are paying money. That’s not the case with SEO. Depending on what industry you are in, once better search rankings are achieved, you only need a few new clients to pay the SEO services off. Even better if you offer a service where the lifetime value of a client is high. With all potential clients though I do suggest running a ppc campaign in coordination with an SEO campaign. Yes, it will cost more but with a ppc campaign, you will get targeted traffic to the site right away. Then as the search rankings improve and they get more organic traffic, we can reduce the spending on the ppc campaign. Running a ppc campaign will also tell us if the website is good at converting so you can generate new leads and clients. If not, then we will have to make some conversion adjustments. I hope I’ve been able to provide a detailed enough answer to the question of how long will it take for my website to rank higher with local SEO. If I haven’t, please contact me today and I’ll be happy to answer any further questions you may have. Last week Google announced that it’s using mobile page speed as a ranking factor for mobile search results. Outside of the obvious reason that it’s 2018 and your website needs to be responsive (mobile friendly), it should also load fast for searchers. In 2016 I wrote a series of blog posts on everything page speed. I did some because Google was using it as ranking factor and let’s be honest, your customers come first, not Google. But to achieve higher search rankings, you have to think of Google and their requirements. If you are interested in higher mobile search rankings, you should read my post on rankings factors for voice search. The page speed series of blog posts was geared towards desktops versions of websites and not mobile ones. This post will outline a few ways to improve the page speed of the responsive version of your website. 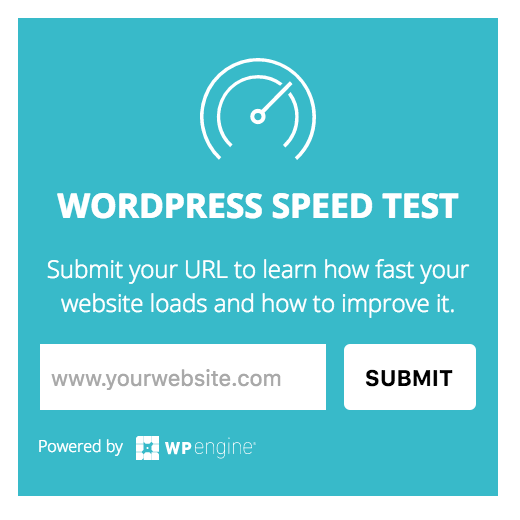 Before I list those reasons, test your responsive websites load speed. I have had some issues with that site but WebPageTest is also a great resource. Be sure to select an option beside “Test Location” that is either “Android Devices – Dulles, VA” or “Apple Devices – Dulles, VA” for mobile page speed tests. As online shopping and browsing becomes more and more popular, people use just about every device to participate, often including their cell phones. In our fast paced world, online browsers are impatient and may not use your website if it does not perform quickly, especially on their mobile phone. If you run a business or organization that experiences peak user times or “busy seasons”, having a fast mobile web page is even more critical in these times when more people will be using the page. The server is a key element in mobile page speed, and the longer it waits to respond to requests from the browser, the longer your page viewer will wait to see the content on your page. The time your server takes to respond is called the “waiting time” or “time to first byte”, and experts recommend this to be no longer than 200 milliseconds after a request is made. The best ways to speed up this time are to improve your web server software or configuration (through coding), enhance CPU and memory resources through improving the web hosting service, or reduce the resources that your web pages use. We have all experienced redirects. These are the automatic instructions that move a web page viewer to another location without them having to click anything. The most common type of redirect, a 301, moves visitors from an outdated webpage to a newly designed page. Redirects take up time, so if you do not need to use them, remove them from your web pages. Often redirects are even slower on mobile networks as they are less reliable than a desktop computer network connection. The best way to start is by using tools such as a redirect mapper to see how many redirects your web page contains. The round trip time of data is the amount of time it takes to be both transmitted from your device to the target destination and returned back to your device. While this interval depends on many factors such as the connection source, physical distance, traffic amount, etc, it is important to regularly measure the round trip time in order to get a clear sense of average times for your page. The longer the round trip time is, again the longer your page viewer will have to wait. One of the best ways to reduce this time is to combine scripts in order to avoid repeated trips. On a mobile device, it makes sense to load the content at the top of the page first, as this is what the viewer will see first. If you code your pages so the server sends data to show the upper content first, your lower content will have slightly more time to load as the viewer browses the already loaded upper half. This gives the perception that the web page has fully loaded faster even if some of the lower content has not appeared yet. This tip will both increase and decrease load time. When data is compressed, it must be decompressed in order to be displayed. This means that the data will transmit faster, but the extra decompression step may take up more time. The trade off here is usually worth it, but this is something to keep in mind as it reduces page weight which is especially important for mobile pages. Try out the 7 tips above to see your mobile page speeds go from over three seconds to under in the blink of an eye! If you need additional help optimizing your web pages, contact us today. It’s 2018 and voice search is on the rise. I’ve been reluctant to use it myself and blog about it. Early last year I did a few searches using Siri and the results were less than desirable. But with the popularity of Google Home, Amazon Echo and many more home assistants hitting the market, the time has come to invest in voice search for local businesses. 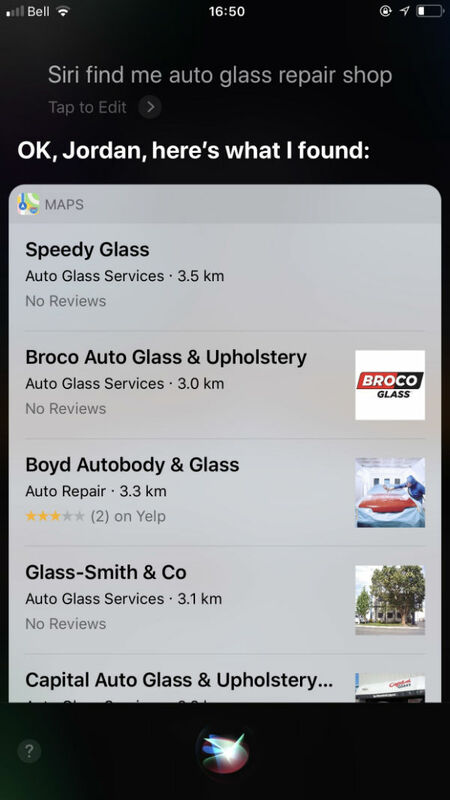 Since this blog focuses on local SEO, I’m going to discuss local SEO searches from the standpoint of using Siri. I hope to do the same using an Andriod device soon. In this post I will explain why your businesses proximity and the diversification of your reviews is important to getting better Siri search results. Here we go! Having location services enabled on your phone isn’t about getting spied on. Location services help Siri and other apps determine your location so they can help you. 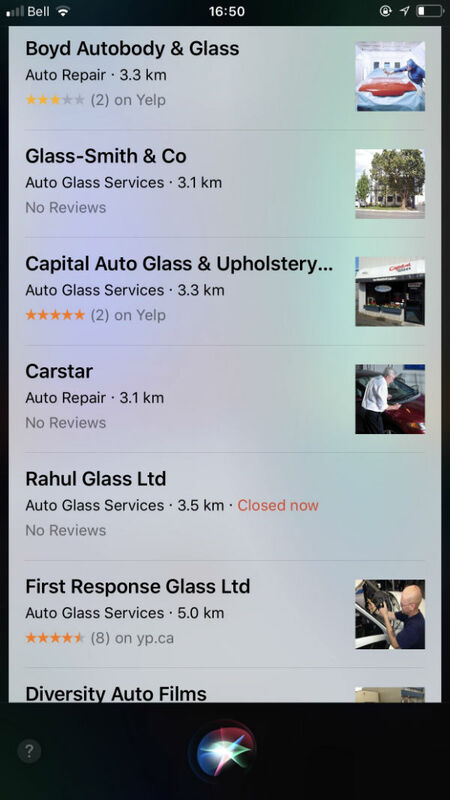 In the case of a local search, Siri will display businesses close by. This is why your businesses proximity to the search is an important factor. 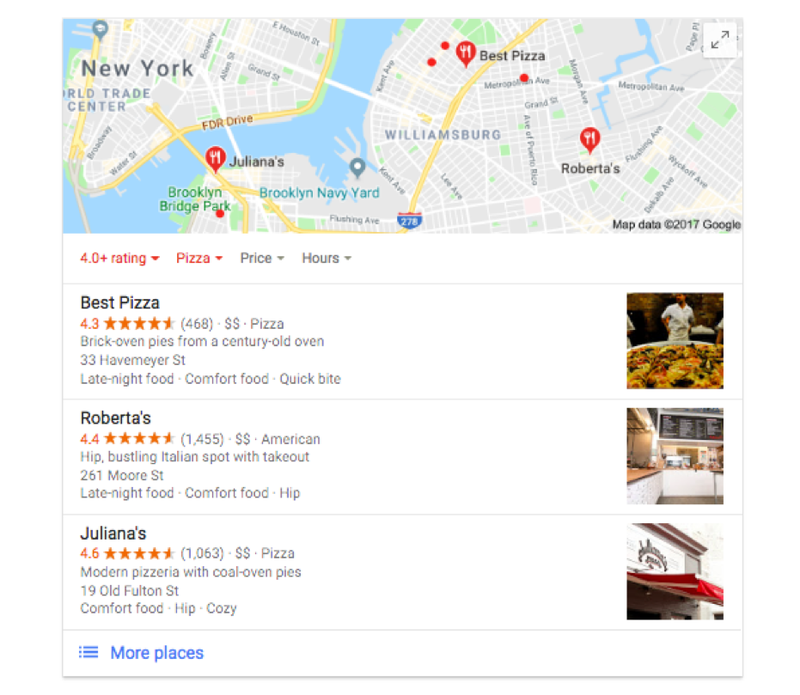 I blogged about the Google My Business results and why location and proximity are important for higher rankings or to even show up at all. The same applies to local Siri searches. Take the example screenshots below of a few searches for auto glass shops, transmission repair and pizza places. 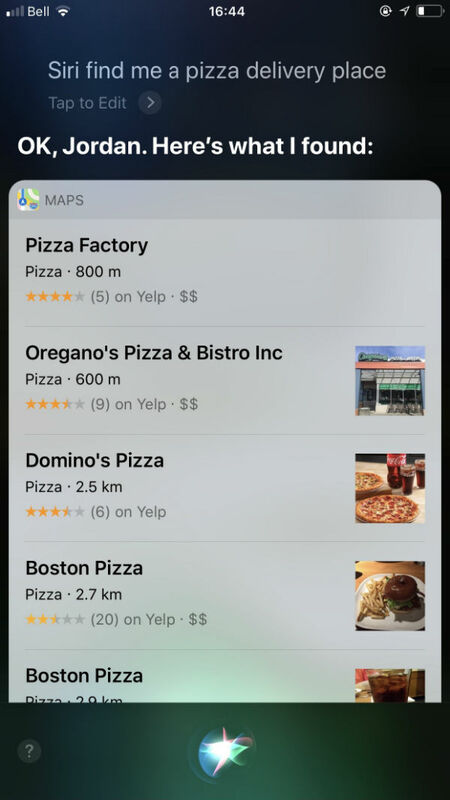 While looking at these screenshots, the first and main thing to note is that Siri is using the Apple Maps app on my phone. As far I know, Siri uses Apple Maps by default and there is no option to switch to Google Maps. By looking at these screenshots you will see the proximity of all these businesses to my location. Once again Siri knows where I am as I have location services enabled. Most of the results are within 800 meters and 3.5 km’s from me. So if you’re hoping to show up yet you’re on the other side of town and 10 km’s away, it’s not going to happen. Siri along with Google want to display the closest business to you. Not so much the best. Reviews go a long way and you should be focused on getting reviews for your business daily. We’ve been asking our clients to diversify the directories and sites that they ask for reviews on because it helps when potential clients do a brand search and see reviews on their Facebook, Yelp, and Yellow Pages listings on top of their Google reviews. More reviews on directories like Yelp and Yellow Pages can help get higher search rankings within those directories as well. And nothing but positive things can happen when potential clients Google a business and see reviews from multiple websites. This builds trust and credibility. Here’s a brand search for a client. Notice the reviews areas. Obviously you can see the Yelp and Yellow Pages reviews. 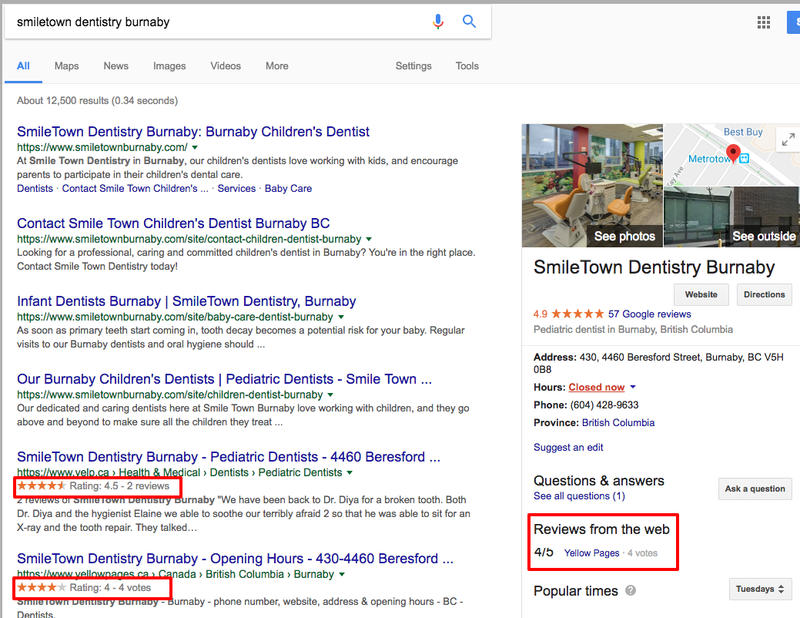 But Google is now displaying other reviews in the “Reviews from the web” in what is known as the businesses knowledge panel on the right hand side of the search results. This is where business contact details from the Google My Business page are seen. For this to happen, you must ensure your business listings are consistent and up to date. Once again, look back up at the screenshots from my Siri searches. You will see the business listings provided have reviews from Yelp and YP.ca (Yellow Pages). It’s clear as day why you should be focusing on diversifying your reviews from a Siri search perspective. 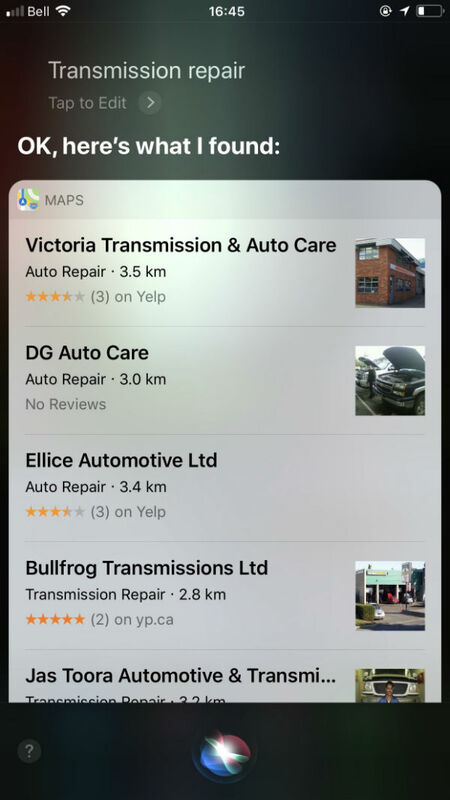 So what can you to do to improve your rankings for Siri local searches? 1 – Head to the desktop backend of Apple Maps, find and claim your business listing. Fill out all your business information including linking to your Yelp, Facebook & Twitter pages. 2 – Head to Yelp for business owners, find and claim your Yelp listing if it hasn’t been. Fill out the information in full including adding some nice photos since Apple Maps is using those photos for their listings. 3 – Ask your clients to write reviews on your Yelp and Yellow Pages listings along with Facebook page. More reviews on multiple sites is better than more reviews on one site. Lately, I’ve been getting a lot of questions about websites and the best way to build custom websites. There are many obvious reasons why you want a custom website. We build custom websites on WordPress but to many people, WordPress seems to be just another website builder. Whether you use WordPress or another platform to create your website, you can still end up with a good looking finished product. So what’s the big deal? Technically, WordPress is not a website builder, it is actually a content management system, or CMS for short. If you aren’t familiar with using CMS’s, you may have a lot to learn. If you are looking for something that is a little easier to master, a website builder may be better for you. Below I’ve laid out some comparisons of CMS’s such as WordPress versus website builders in order for you to decide what may work for you. It is a good thing to note that when choosing a platform to use, it depends on your comfort and your skills. First, let’s talk about ease of use. If you use a website builder, you are pretty much guaranteed that it will be user friendly. Sites such as Weebly have easily managed page editors that help you add, move, or remove elements from your page in a flash. On WordPress, you will not see this same visual interface. WordPress uses what is called a WYSIWYG (what you see is what you get) editor to create a visual interpretation of the website. As far as ease of use goes, a drag and drop editor is much easier to figure out, especially if you are not that computer-savvy. WYSIWYG is basically like a Word document. If you can edit a Word doc, you can use WordPress and WYSIWYG. 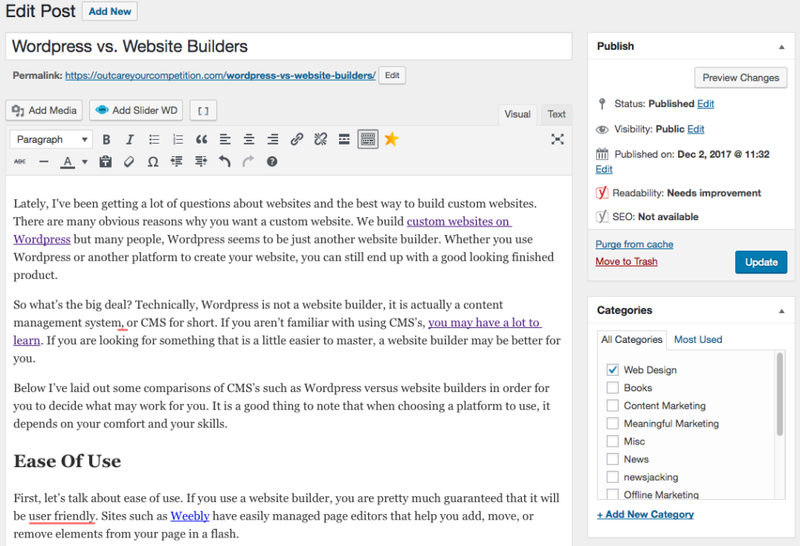 Below is a screenshot of the WYSIWYG post and page editor for Wordpres. Other ease of use elements includes the ability to insert new themes or plugins without using code on website builders. To do this on WordPress, you may need to change code, and not everyone is savvy with this. Another thing to consider is the difficulty of performing simple actions on WordPress. The interface itself can do many wonderful things, but the challenge may be finding out just how to do them. The second element I want to discuss is flexibility. One of the best things about WordPress is that it can be used for a variety of website needs- whether that be a blog or an online store. As you just saw, sometimes the cost of this flexibility is the ease of use. Because WordPress can just do so many different things, it is bound to get a little complicated. If you are using a website builder, you generally need to be a little more picky and choose one that will suit the type of website you want to create. Some website builders will power small business websites or personal websites, while others are more suited to power large multi-page sites. For unconventional types of websites, you may want to look to WordPress as it can change to meet your specific needs. Next, themes and plugins is an element to consider. Due to the large number of people using WordPress, there are plenty of themes and plugins readily available to you. If you want your website to perform a certain action, there is probably a plugin that will let you do it. But with this volume of themes and plugins comes with some that do not work that well. Some of these plugins may require extra tweaking which defeats the purpose of the ready to go plugin. On the flip side, website builders may not have as many themes and plugins available, but the ones they do have always work. Many people want to know what is better for SEO. Having done SEO for a few past clients websites who used Wix and Weebly, they’re SEO is pretty good. You can add page titles and descriptions for each page. We did not notice that their websites were impacted negativly from using their platforms. For a few reasons though we love WordPress for SEO simply due to the fact we love the Yoast SEO plugin. There are a lot of great features to that plugin and the major one is being able to create templates for page titles and descritptions for pages. This saves a lot of time as a template can be used to ensure pages and blog posts have the proper SEO information filled out. Wix, Weebdly and other website builders don’t offer this. Yoast also has a feature that allows you to see all of your Google Search Console data from your WordPress dashboard. This saves the hassle of logging into your Search Console dashboard. Again, we believe that the website builders have pretty good SEO but WordPress and Yoast are a step above. Finally, let’s talk about hosting. When you use a website builder, your domain name gets connected to the builder and is already configured. With WordPress, you need to find your own web host. It may also require some reading up on FTP, which is a way to upload your WordPress files to your newfound host. A benefit of finding your own host is that you are able to download your WordPress content and move it to another host, while website builders will host your site forever. If this puts you in unfamiliar territory, you may need to recruit a friend or face a learning curve. The big takeaway is that choosing between a website builder and a CMS like WordPress heavily depends on you- how much time you have to invest, what your current knowledge of computer code is, and what you want your website to do. If you have an unconventional idea but aren’t sure if you have the skills to navigate WordPress, don’t be discouraged. There are plenty of online tutorials that can get you started. Contact us if you have any questions or learn more about our WordPress design and development service. To get your small business site in front of as many potential customers as possible, you need on page SEO. Search engine optimization is vital to your growth and success. With proper on page SEO tactics you can boost online visibility, external links, keywords, and most important of all, organic traffic. The top three marketing tools a small business has are . . .
On page SEO can make a big impact on your bottom line, not just by increasing traffic, but by also cutting your marketing spend in half. Do you run PPC ads on Google? With stellar on page search optimization in place, you can rank page one without running ads. 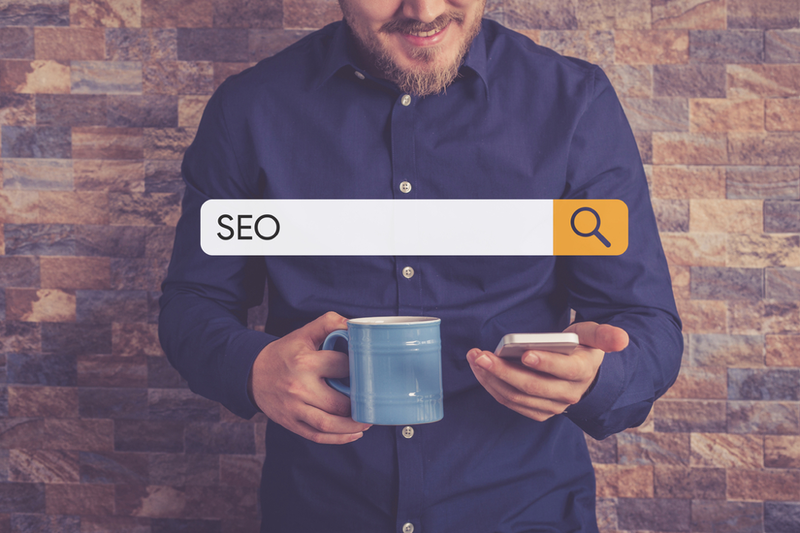 Make search engine optimization a priority in 2018 with the following SEO tips for small business online growth and success. Mobile has become the preferred search device for products and services, making it essential to have your small business listed. In fact, 50 percent of mobile consumers who will visit a store they found in local search results within a day. 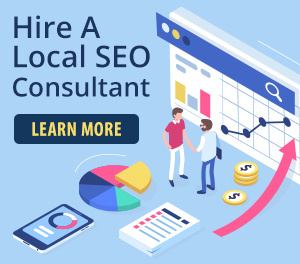 The first step is to set up a local listing on Google My Business. 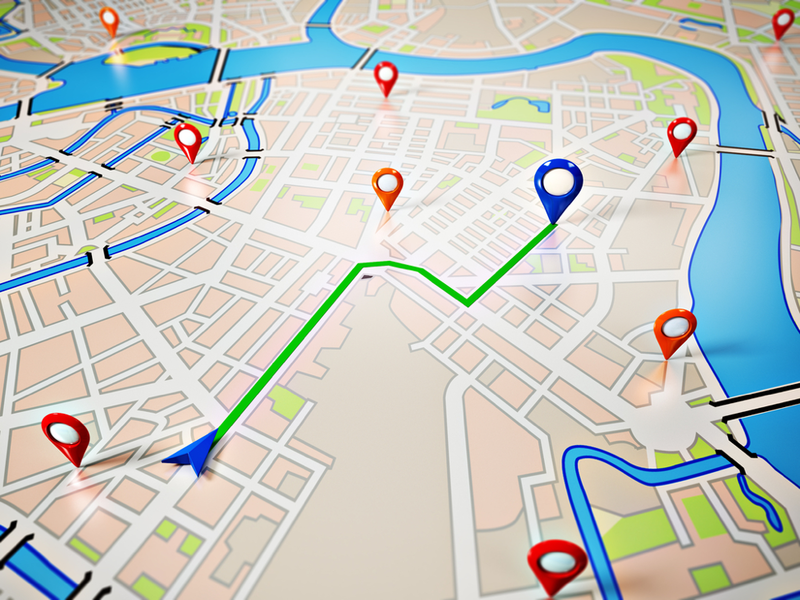 When someone searches for products and services similar to yours, they will see your business, website, and also get featured on Google Maps. Leverage other local listing sites like Yelp or Angie’s List as well. The more local listings, the more your small business will appear in SERPs. Local listings are also the perfect platform for your customers to rate and review your business, products, or services. This is more important than ever, since online consumers check ratings and reviews prior to making a decision to buy. The New Year will usher in a few changes for on page SEO, and one of them is Google mobile-first index. This will give priority to mobile friendly, fast loading sites when a user searches via mobile. This is very important for future business growth and success, especially since most consumers are now more mobile than ever before. Make your site’s content readable on mobile devices, including the text and font you decide to use. Avoid software that is not mobile-friendly like Flash. Think like a user visiting your site by ensuring your pages are easy to scroll and navigate. Make your CTA buttons and anchor text links easy to see and not in the way of a users scrolling thumb. Ensure your page load time on mobile is optimized and under one second. To check these potential on page SEO pitfalls, turn to Google. Google has a number of tools you can use to check just how mobile-friendly your site actually is . . .
Google algorithms are always on the hunt for duplicate content and poorly constructed SEO titles (page titles) and meta descriptions. These issues could cause your small business website and pages to drop in ranking. The first step to better on page SEO is to look at your page titles and meta-descriptions. You want to tell Google exactly what your page is about, and why it fulfills search intent. 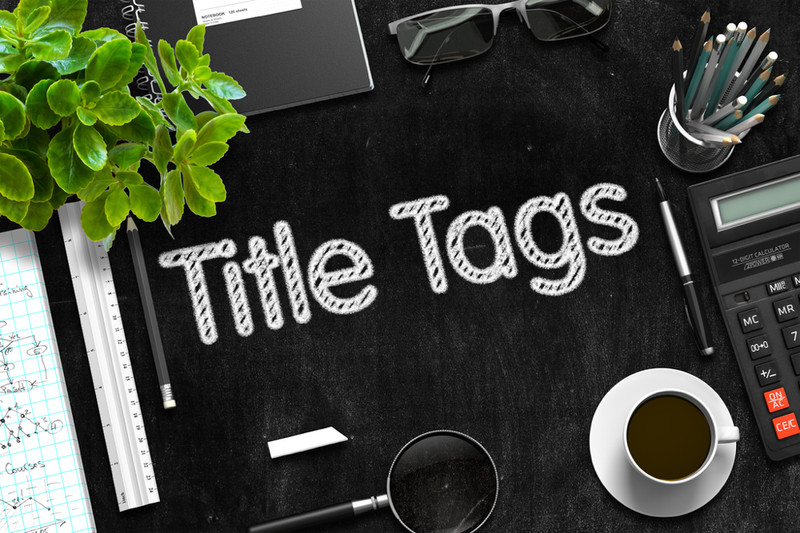 Make a list of all your title tags and start looking for duplicate keywords, and subpar title descriptions pages that promote your products or services. 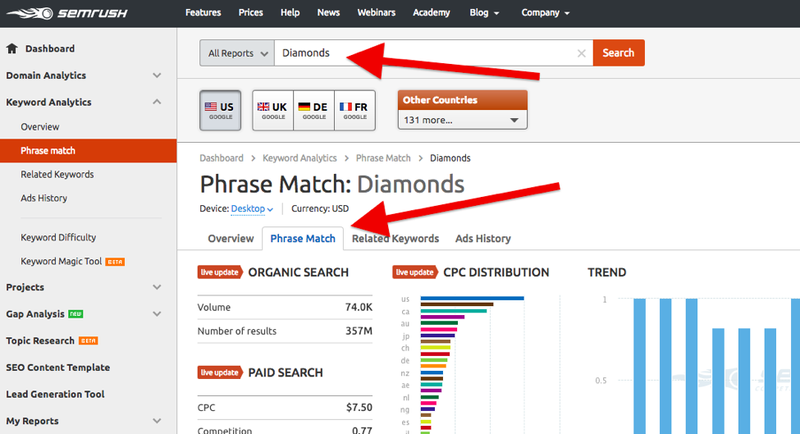 Then get a little creative by replacing those duplicate keywords using online tools like SEMrush’s Phrase Match. 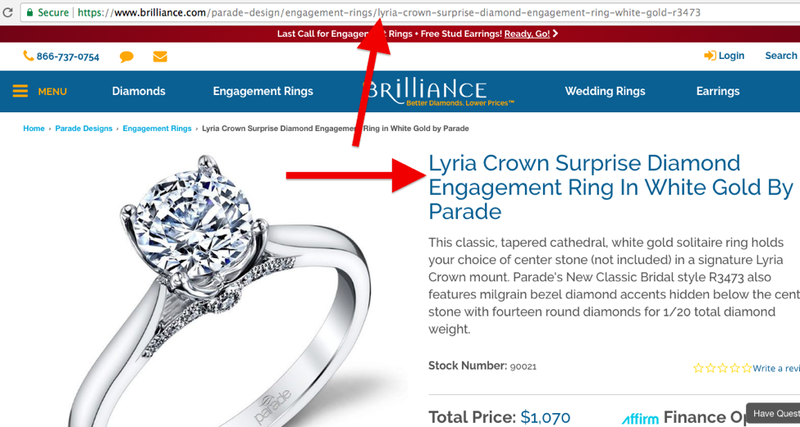 To highlight this important on page SEO tactic, here is an example from Brilliance, for product page best practices, listing a number of keyword rich options. Time to Make On Page SEO a Priority . . . Your small business can’t afford to ignore proper on page SEO tactics. These 100 percent free changes can decrease your need for large PPC ad spend while also providing a better user experience for your site’s visitors on both desktop and mobile. How will you make on page SEO work for you in 2018? 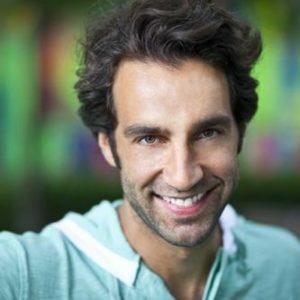 Customer service, honesty and results. Learn more about us and the three pillars our company stands for.